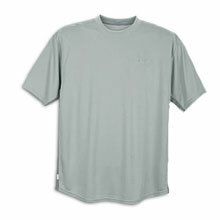 I like Nike Sphere Dry T-Shirts and they are very light, don&apos;t cling and dry out really fast. I find that I don&apos;t usually get cold when hiking as I&apos;m moving so much quicker with trekking poles, so the more breathable the better. Available from Nike for $25. This entry was posted in Backpacking, Clothing, Gear Reviews on September 10, 2006 by brett.